A 38 North exclusive with analysis by Joseph S. Bermudez, Jr. and Jack Liu. 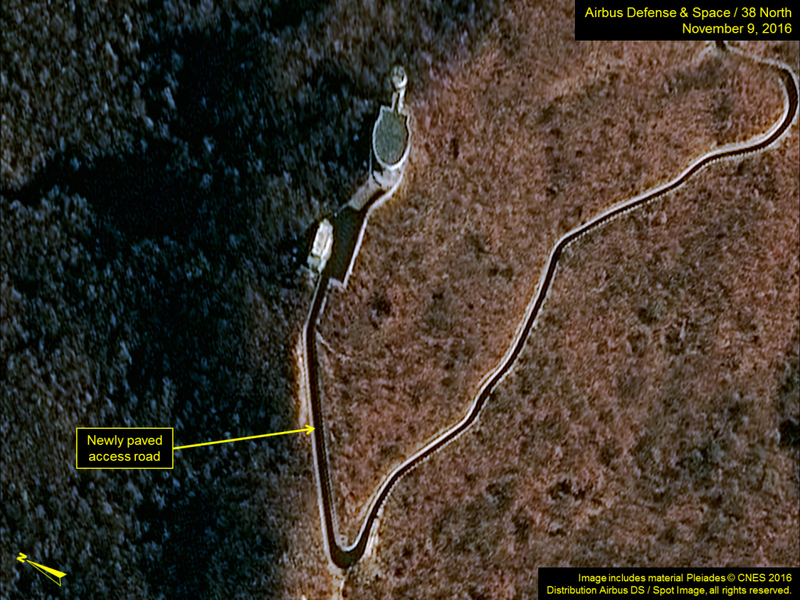 Commercial satellite imagery from November 9 indicates continuing construction activity throughout and immediately outside of the Sohae Satellite Launching Station. This does not appear directly related to any recent or forthcoming engine test or satellite launch as recent media reports have speculated. Instead, it suggests continued infrastructure development that will allow the facility to operate on a more full-time basis with increased numbers of personnel in residence. At the vertical engine test stand the rail-mounted environmental shelter remains positioned immediately adjacent to the test stand, as it has been over the past month. While it cannot be determined from imagery alone if a rocket engine is inside, external factors suggest that no engine test is imminent. 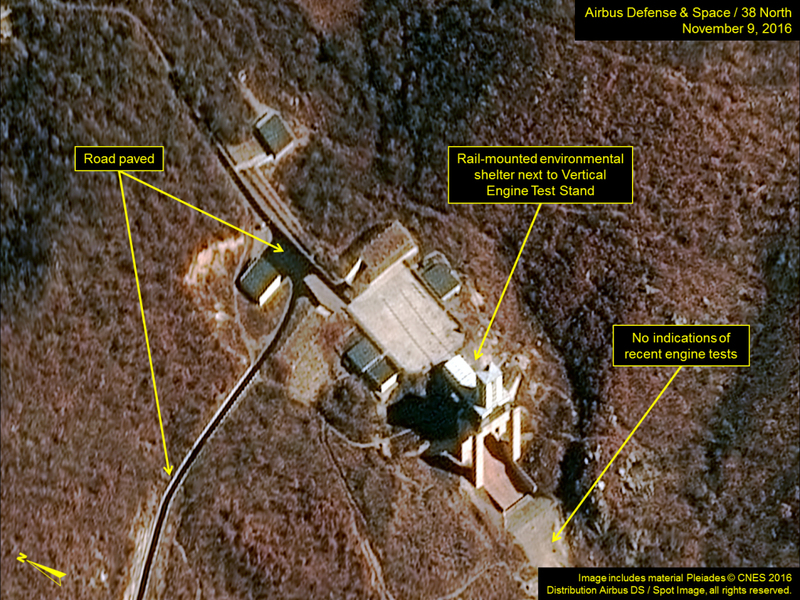 Additionally, natural-color and color-infrared imagery indicate that no unreported tests have taken place recently. During the past several weeks, the access road has been paved from the VIP observation and telemetry area, past the vertical engine test stand and toward the launch pad. Figure 1. No signs of recent engine test. Figure 2. Road from VIP observation and telemetry building has been paved. 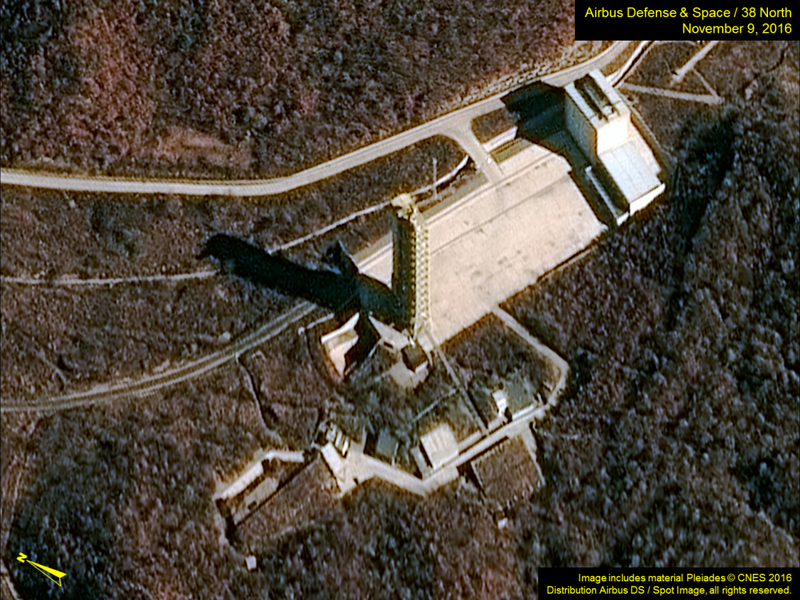 At the launch pad, the rail-mounted transfer building remains positioned on the south side of the launch pad; the gantry tower with environmental covers remains closed and no vehicles are observed either on the pad or near the fuel and oxidizer bunkers. While the environmental covers on the gantry tower prevent detection of a rocket within from imagery alone, external factors suggest that no satellite launch is imminent. Figure 3. No activity at the launch pad. As part of a long-term infrastructure development plan, the support and warehouse area in the valley immediately north of the launch pad is being rebuilt, and construction has been ongoing throughout most of 2016. 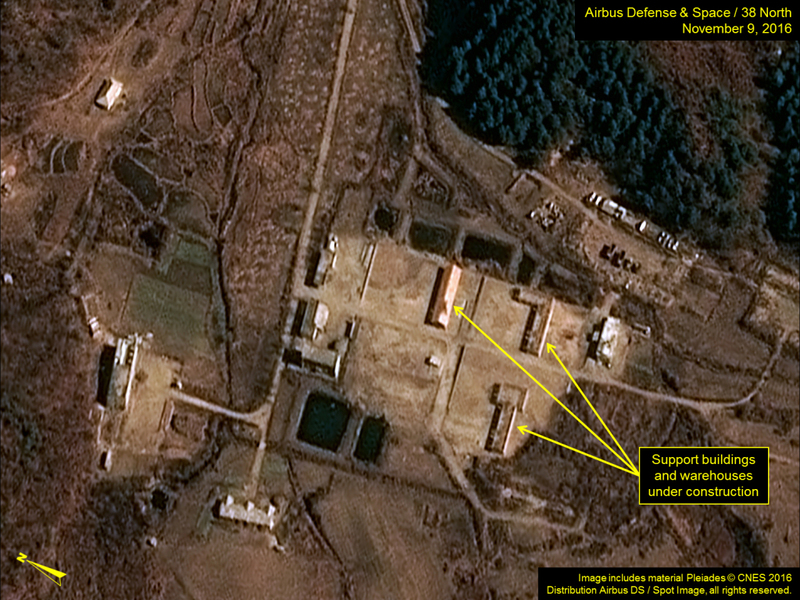 Imagery from November 9 indicates that roadwork and construction of shops, warehouses and support buildings are progressing steadily. When completed, probably by spring 2017, this area will enable the facility to be operated on a more full-time basis and with increased numbers of personnel in residence. Figure 4. Construction continues at the Support and Warehouse Area. Approximately 500 meters north of the main facility entrance, construction of a small passenger rail station has been underway since May. 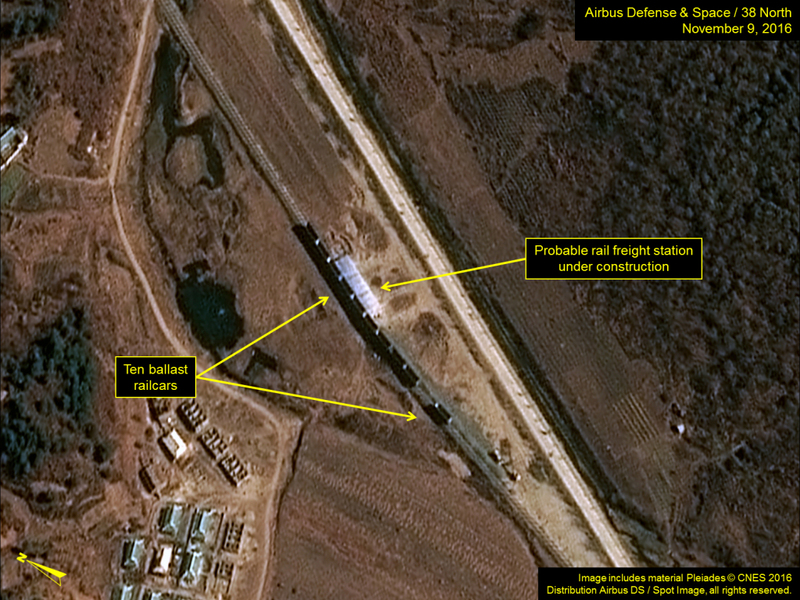 Imagery from November 9 shows the presence of 10 ballast railcars on the track adjacent to this new station and several construction vehicles working on the rail embankment. Work has been ongoing since August to reinforce the embankment and re-ballast the track in the area. Figure 5. Railcars and construction continue at rail station. 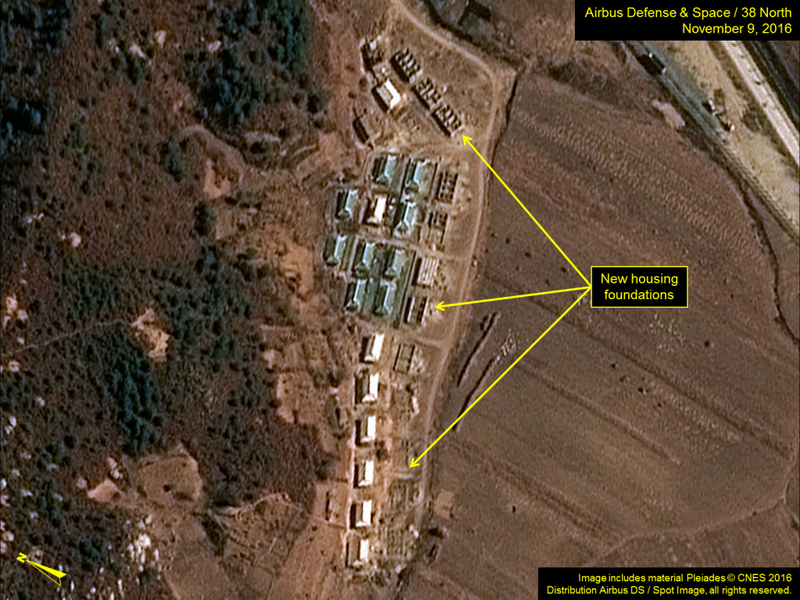 A modest housing construction effort has been underway since 2014, adding new units immediate outside the Sohae facility. At the housing development opposite the new rail station, there are now 17 units and foundations for another 12 are being prepared. Figure 6. Expansion of housing continues.